Hi there! Today I’m reviewing Prada Infusion d’Iris Eau de Toilette. 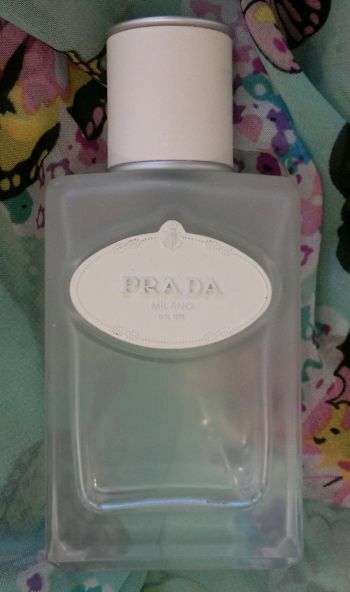 I’ve been wearing this fragrance a lot this spring and summer, and I wanted to review it before it’s finished. This fragrance contains the following notes: iris, violet, heliotrope, cedar, galbanum and lily-of-the-valley. What’s the fragrance like? It smells of iris root, violet, powder, clean laundry and spring. Despite the powdery notes, the fragrance has an overall fresh feel. I think this is a great fragrance for spring and summer. When it’s over 30C, I prefer lemon and grapefruit scents. However, I think Infusion d’Iris wears really well on the warmest summer days. Awesome stuff, Prada! Prada Infusion d’Iris Eau de Toilette is available as 50ml, 100ml and, apparently, even as 200ml!